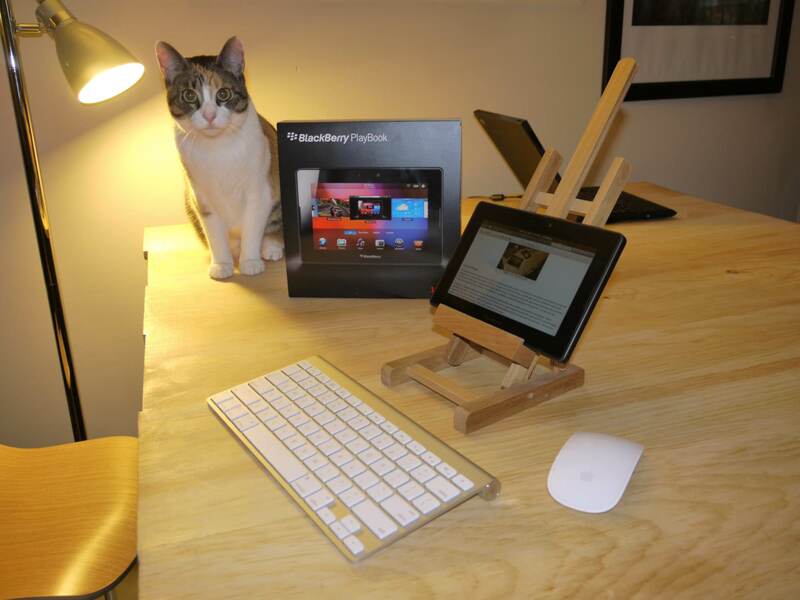 Summary: The BlackBerry PlayBook, released today, is already seeing mixed reviews. However, the complaints are almost all due to a lack of apps and basic PIM applications. While I agree with these complaints, the device itself is a real standout. It’s the first great 7″ tablet I’ve seen. Both the hardware and the underlying OS, while missing end-user applications, are fantastic. QNX is a bulletproof OS, the UI is intuitive and elegant. This is a great OS, well executed, on quality hardware. All that’s missing are the apps. Should RIM have waited a little longer? I don’t think so. On first boot, the PlayBook takes a minute or two before taking you to a brief tutorial, setting up WiFi networking, and then checking for software updates. Then you get to wait for 20 minutes while it downloads and installs a 300MB update. This was on day -1 for the PlayBook. While OTA updating is welcome, it would be nice if you got to use it for a couple of minutes first. RIM absolutely nailed the hardware. This is a 7″ tablet that exudes quality. It is very solid and feels better in the hand than an iPad/iPad2 let alone the Coby Kyros, Archos 7o, or Galaxy Tab that I have used. It weighs about 1 pound and exudes quality. The only niggling problem I see hardware-wise is that the power button is frustratingly difficult to push. For me, this isn’t a big deal. On the device, you will find a mini HDMI connector, a dock connector, Micro USB for sync and charging, the aforementioned power button, a three-way volume/play/pause button, and a headphone jack. The tablet itself features a dual-core A9 1GHz CPU with a 7″ 1024×600 IPS display (I think. The viewing angles are great.) It has 1GB of RAM, and the best speakers I’ve ever heard on something this small. Seriously, they are amazing. And I’m picky. 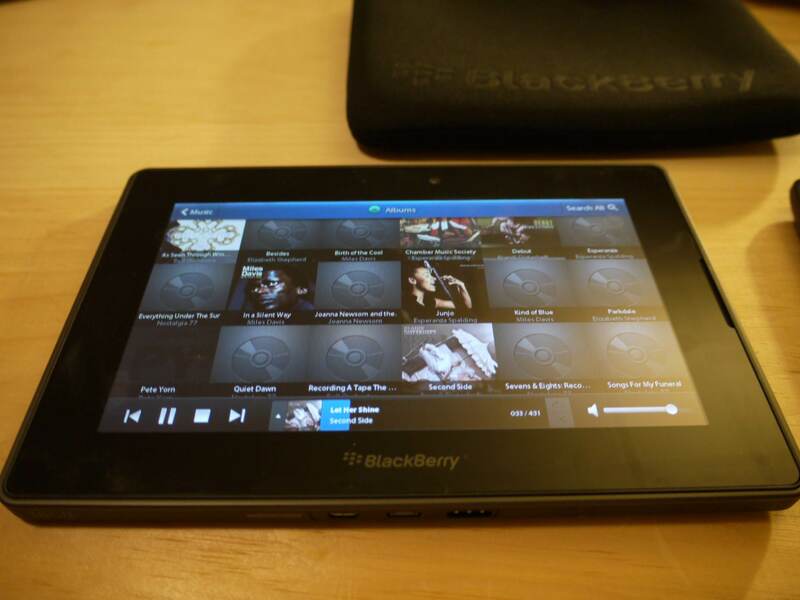 As mentioned above, the PlayBook features RIM’s new QNX-based operating system. The solid QNX-core features an absolutely fabulous user interface up top. Everything flows quickly and fluidly. Using the OS, it behaves a bit like a well-thought-out iOS and WebOS combination. Like HP/Palm’s WebOS, this is a properly multitasking operating system. Running many apps with many browser tabs open at the same tim, I have yet to see any significant slowdown. The PlayBook is very efficient, and bundled applications work very well. It is fast, fast, fast. In addition to a fantastic WebKit-based browser, the BlackBerry PlayBook ships with a capable and attractive music program, a great calculator, Kobo Books, a working music store (a rarity in Canada) with a good selection of jazz, a podcast app that found CBC Spark and TVO’s Search Engine, a good PDF reader, and a smattering of other useful programs. [Word|Sheet|Slideshow] To Go are preloaded and work well, allowing for the creation of MS Office documents. There are also links to Gmail, Hotmail, Yahoo Mail etc. This is where things get a bit strange. The PlayBook runs a completely new OS, with completely different apps. It is a complete departure from the typical BlackBerry OS. It doesn’t use Java, and can’t run existing BlackBerry apps. The PlayBook ships with some great and unexpected programs, like the NFB program, but completely lacks native email, instant messenging, BlackBerry Messenger, a native calendar, task list etc. It does ship with BlackBerry Bridge, a reportedly neat suite designed to offer this functionality with an existing BlackBerry, but Bridge only works with BlackBerry smartphones. This effectively renders the PlayBook useless on launch for anything other than browsing, reading PDFs, reading books from Kobo, or listening to music. It does excel at these tasks, but the lack of built-in communication programs, coupled with an almost barren App World, mean that as of April 2011, you really can’t do much outside of browsing with the PlayBook. It does browse very well, but if you’re coming from and iPad or an Android tablet, or even a stock smartphone, you’re going to be left without much to do very quickly. To make matters worse, the App World is a wasteland of half-baked proofs of concept. RIM has promised an Android compatibility layer soon, as well as native calendar/mail/tasks. Still, they need to ship these NOW. Not only that, as with Wine on Linux, the Android compatibility layer is a double-edged sword: True, it gets them thousands of apps for “free” but it discourages developers from creating beautiful native apps. I haven’t seen elegant Android apps. Functional, yes, but not elegant. In some ways, I think it may have been best to not promise the Android layer. Still, that hasn’t exactly worked out for HP/Palm. In fact, the PlayBook App World reminded me very much of the early WebOS App Catalog. However, this is day one of a brand new OS and a brand new platform. All of the fundamentals are right, it’s just the apps that are missing. Granted, this is a big “just”. Back to a more positive note: the PlayBook has some unexpected and thoughtful extras. For starters, you can pair both a Bluetooth keyboard and mouse. Moving the mouse, you are presented with a traditional cursor on the screen. At the moment, this is of limited usefulness, though it should make browsing and Flash a more laptop-like experience. The mouse cursor may be passe, but there are good reasons that mouse and keyboard have been the dominant interface devices for the last several decades. RIM has clearly avoided throwing the baby out with the bathwater here. Sure, they may hide the ability to use a mouse, but they don’t stop you. One can easily envision remote desktop apps and many traditional programs translating better to the PlayBook than to other tablet operating systems. I’ve only been tinkering with the PlayBook for a day, but it has already surprised me a few times with novel approaches and unexpected features. It’s not quite as straightforward as a USB mass storage device, but it’s pretty good. It doesn’t work at the moment on Linux but I haven’t poked around too much yet. I hope that a Dropbox client happens quickly, as this is my preferred way to keep files in sync these days. Still, until there are apps to handle various filetypes, this isn’t a pressing concern. Still, if you’d like to tinker with QNX or are a developer, the PlayBook is very attractive. As soon as RIM sorts out the core functionality and the apps begin to flow, the BlackBerry PlayBook will be a great device that will be easy to recommend. Given all that they have accomplished in this release. I think they have done an outstanding job. Congratulations, RIM. Now, get back to work and finish off the end-user software! I’ve had a chance to test out Bridge and I’m truly impressed. 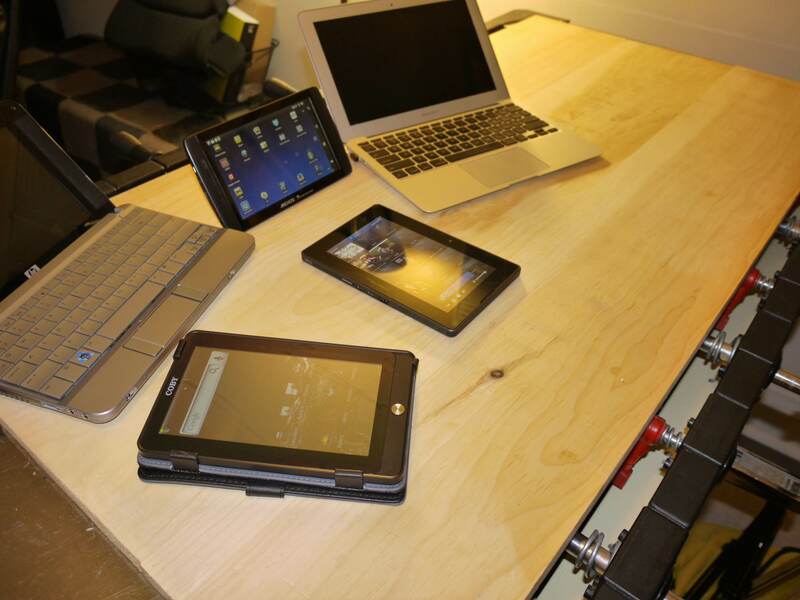 It is a great way to access your data on the tablet in a transient way. I truly believe that RIM is on to something with Bridge and that they should bring this to iOS and Android phones, rather than bringing native programs to the PlayBook. The PlayBook plays well in the sun! I’ve had the PlayBook for over as month now and I use it daily. The size is great for on-the-go use. The app situation still stinks but RIM has already rolled out a few significant updates, and the decent Flash support does largely mitigate the lack of native apps, at least for me. (Though I say this as a staunch Flash hater who would much rather see quality native apps.) 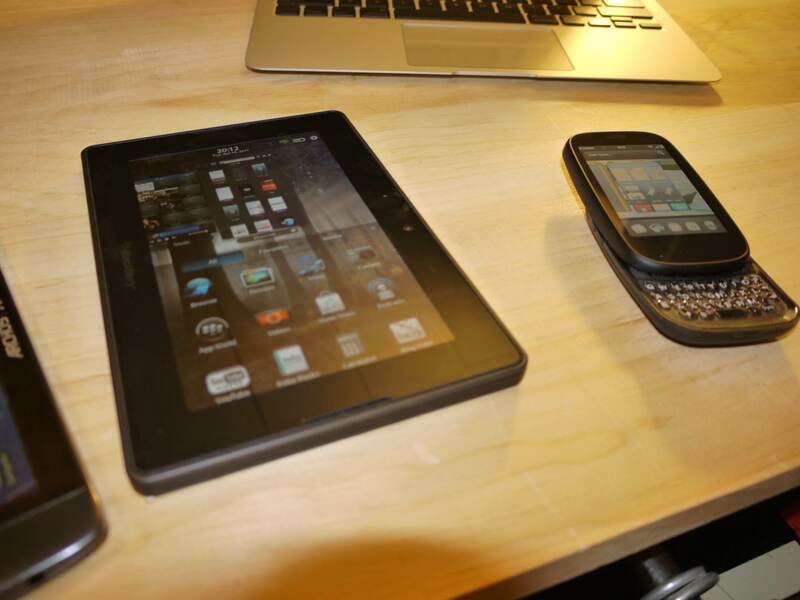 I used the PlayBook extensively at PSEWeb 2011 to check out many of the technologies discussed. It worked out very well.